HEXUS reviewed the Intel Core i7-7820X (8C/16T, 14nm Skylake-X) in mid July as the first batch of these Intel high-end desktop platform (HEDT) chips were released. At the time we learnt that higher core count Skylake-X processors were lined up for release in Q3 2017 (soon-ish). So we eagerly await the release of the Core i9-7920X with 12C / 24T at $1199, the Core i9-7940X with 14C / 28T at $1399, the Core i9-7960X with 16C / 32T at $1699, and the top end Core i9-7980XE with 18C / 36T at $1999. High profile overclocker der8auer has already managed to get his hands on one of the upcoming 12 to 18 core HEDT chips, specifically the Core i9-7920X. What would you expect him to do with it? Of course he is very likely to overclock it using lashings of LN2 - but before that he's shared a photo of the chip having been delidded. Intel Core i9-7900X, left, and the new Core i9-7920X, right. Delidding can be a hazardous practice but der8auer is more than well versed at this procedure, he even sells a range of tools to enthusiasts interested in delidding at home. For the Core i9-7920X the new Delid-Die-Mate-X was utilised, which is yet to go on sale. You can see in the chip picture above right, that the die and surface transistors around the die look untouched by the delidding process: there's just a bit of residue left behind. As PCPer reports, it looks like this chip sample doesn't use a solder TIM but some easy to clean off paste. Another observation is that the Core i9-7920X die is "huge". All of the upcoming 12 to 18 core Skylake-X SKUs will have this same physical die size. 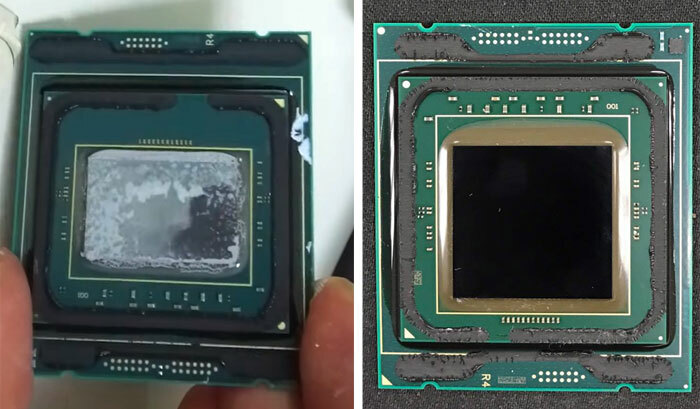 You can see it compared to the 10-core die of the Core i9-7900X above, left, which was also delidded by der8auer (you can read more about that here). the prices for these things is outrageous though… that is just my 5 cents… if it means I would get maybe like 5% extra performance then am sure could spend half the amount and go to the competetitor… not a fanboy of either brand but 2000 dollars for a chip? could get 4 GFX cards for that. That's a very expensive hobby. Does der8auer makes loads of money from playing with CPUs or is he already a loadsamoney?